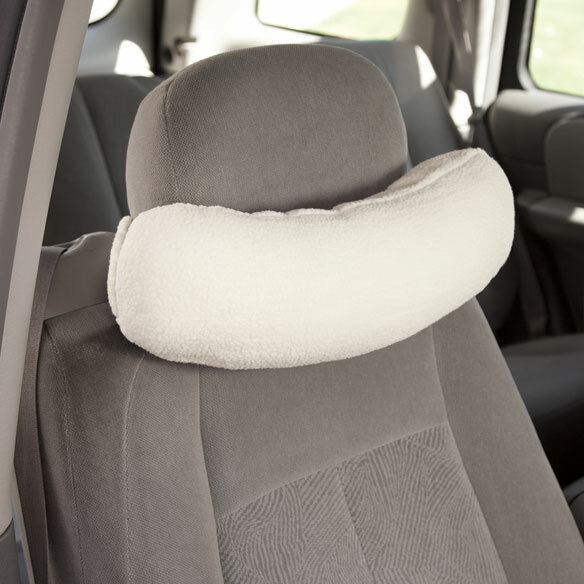 Sherpa car neck support provides ergonomic comfort for head and neck. Soft, breathable polyester cover; spot clean. Elastic strap of car neck support pillow fits around auto headrest. 15" long. Made in USA. This is a great product. I sometimes sit in my car waiting for others. This is a very comfy way to rest. I can lean back into it while I am driving, too. It is nicely made and worth the price. Pain in back of neck. I bought this my wife to use in our car. I rest my neck in the car. Oh!! This I absolutely love! My back, and shoulders begin to hurt when I am driving. This neck support has helped so much! I am so glad I got this!